Something serious happened recently up north: the season changed. It’s not just the temperature, the coolness in the air, though that plays a part. There is a change in the color of the light, a movement from yellow to white. Not to mention that there was more than one treetop verging on colors other than green on my drive back up from Chicago last week. I’m not going to say the f-word yet, but I feel its inevitability hovering close. The anxiety that leaving summer engenders for me has more than a little to do with the short, intense season of produce. Which is funny, because it’s not like that anxiety is born out of the possibility of starvation during winter (or maybe it is, written somewhere on our DNA). It’s just that there is so much produce all at once! You can’t possibly eat all that you harvest if you garden, or even all that you are compelled to buy if you are a farm market devotee like me. In Lebanon, when greeted outside their doors with this abundance, there is an ancient traditional response: mouneh, which means “to store.” The mouneh was everywhere I went when I visited Lebanon in April, rows and rows of beautiful jars often covered with a little piece of burlap and always tied with a string. 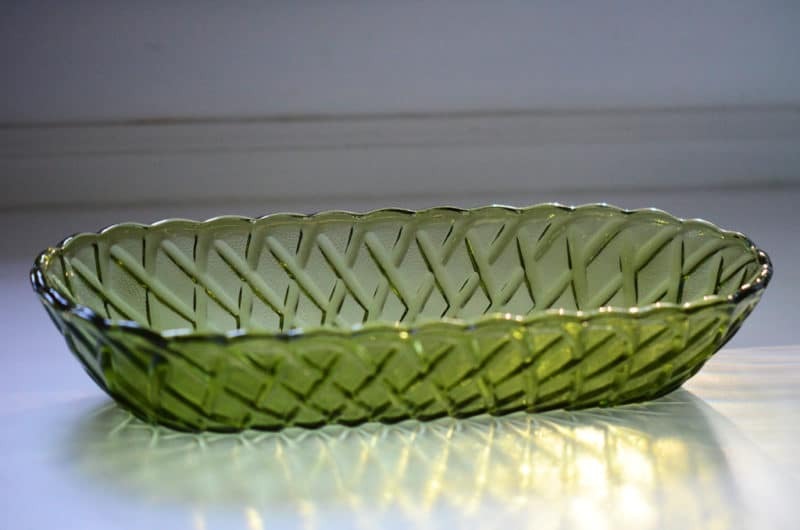 Even though there were pickles of all kinds on our table at home, lift in particular—and always in a very specific green pickle dish of which my mother must have bought several, because my sister and I each have one of these dishes—my first real awareness of mouneh from Lebanon was, oddly enough, in San Francisco. A beautiful bottle of rose syrup was among the elixirs on the shelf at the pastry station at Boulette’s Larder. I noted the brand, Mymoune, found it online, and ordered myself some. When I held the bottles in my hands and tasted their glorious contents, good things started to happen. I started to imagine a blog, and its name. The mouneh led me to a very special book by that name, which I’ve been reading often over the last year. 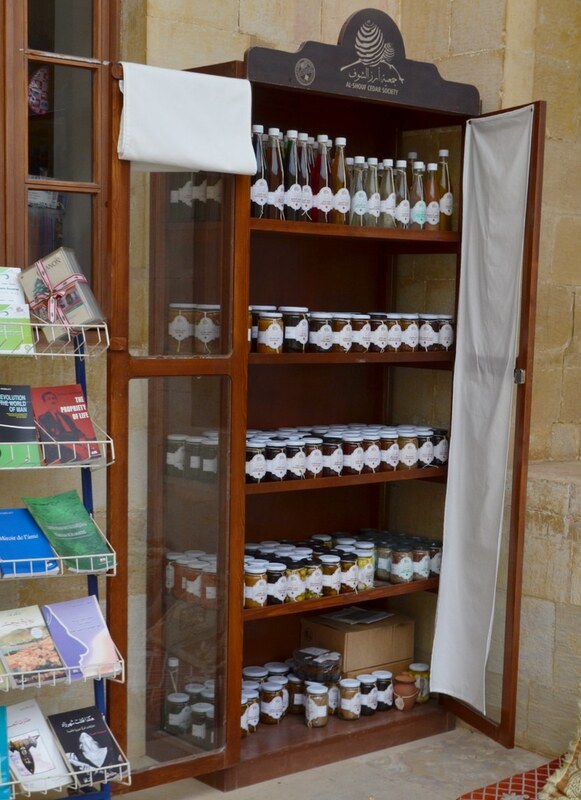 Barbara Abdeni Massaad meets, photographs, and writes about every possible artisan of mouneh in Lebanon. Hers is a work of art in and of itself. On the first day of my trip to Lebanon, I was in the Chouf mountains where mouneh is a particular art. I wanted to spend the whole day finding as many different shelves of mouneh as possible; instead I had to settle for buying some. 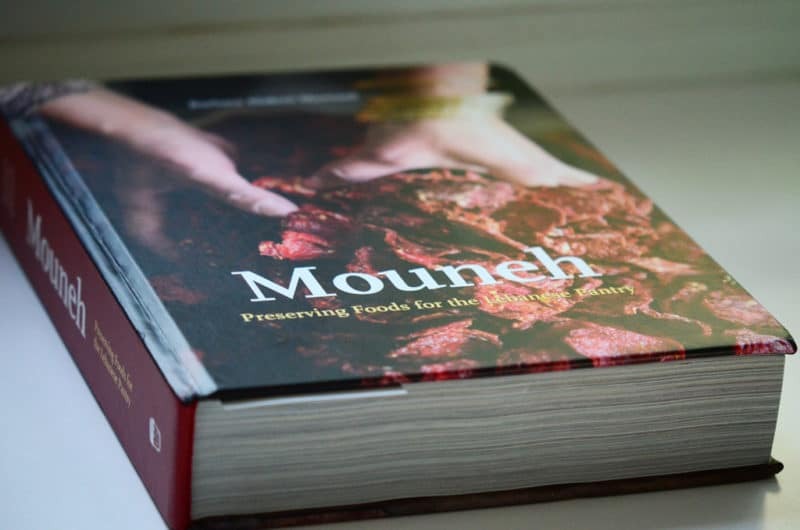 I don’t advise trying to bring lots of mouneh home in your luggage, by the way, unless you like olive oil-coated and rose-scented shoes, which trust me, you don’t. 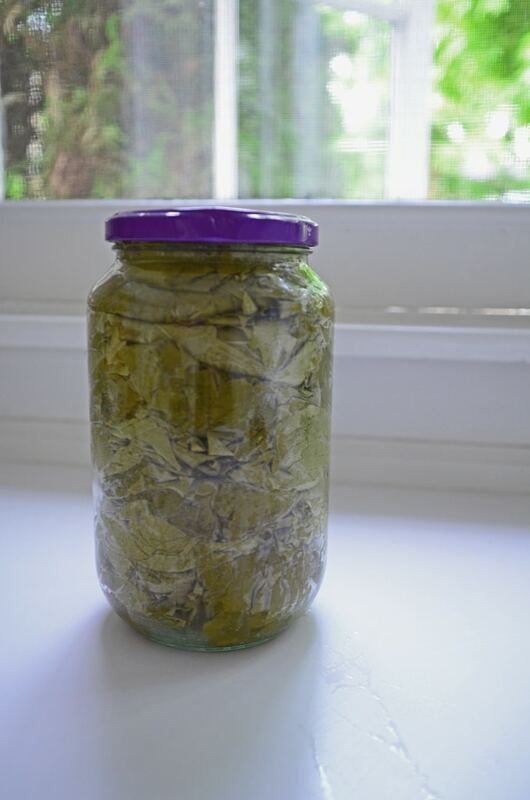 The most important of my mouneh survived, which was the jar of grape leaves my cousin May gave me that she picked and jarred in our family village of Dier Mimas. Certainly neither we nor the Lebanese, even in the remote areas, have to store up for winter out of need. We can all get these things at the store and they taste fine (God bless Wickles). There is another kind of necessity, though, that we do have. It’s one that engenders the desire, the pull, to store up our produce. It is no doubt about eating locally and all that entails, as well as about getting away from processed foods and moving toward real food. And homemade pickles are downright delicious. My mom talks about the flavor and crunch of her mother’s pickles often, and she hasn’t had them in a lot of years. But it’s also about something just as important. It’s about remembering (my friend, the poet Cindy Hunter Morgan, captures this stunningly here). I want to preserve—to ‘keep alive’—the feeling, the memory, the taste of summer up north. I want to do it myself in my family’s kitchen, even in the very small way that I do, because the act helps me hold on to summer with a small token, but also let it go and keep learning to accept the swift passage of time. I want to preserve simply because my mouneh makes me feel like I’m doing something good, worthwhile, alive. No matter how alive we want to feel, there aren’t so many of us who are going to do the sterilization and hot water baths needed to safely give pickles shelf life. But you can still pickle and they will last in your refrigerator for weeks, sometimes months. There are many different ratios and flavorings used for quick pickles. I like this one because it has some sweetness to it; if you prefer, just leave out the sugar. 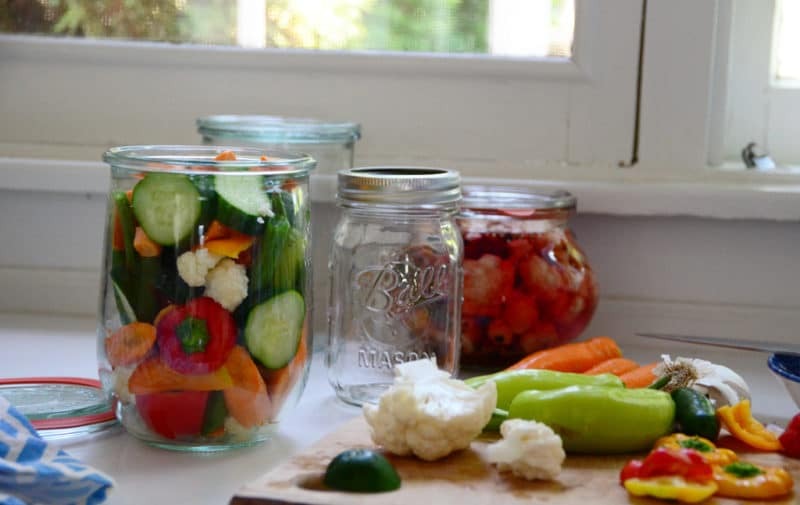 Try all kinds of vegetables; combine them in one jar or separate them. Slip a slice of beet into a jar of cauliflower to make it a lovely, traditionally Lebanese shade of pink. Use fresh herbs like dill and thyme, and whole spices. Powdered spices cloud the brine, but if you want your cucumbers to taste traditional, use some powdered turmeric in the mix. Cousin Jim says you can save the brine when the pickles are gone and use it for the next batch. This recipe makes two large jars. In a small sauce pan, bring the vinegar, water, sugar, salt and spices to boil. Reduce heat and simmer for 10 minutes. Remove from heat; cool. Cut up the carrots, cucumbers, peppers and cauliflower into bite-sized pieced. Leave the green beans whole. If using hot peppers, pierce them all over with a knife. The sliced cucumbers benefit from resting among ice cubes in a colander in the sink for a good 30 minutes for better crunch. Save the tops of the peppers; they look lovely facing out here and there on the sides of the jars. 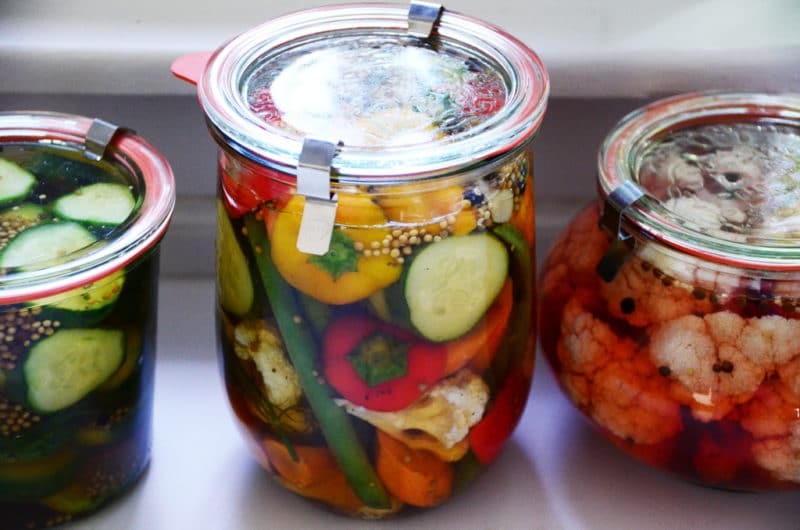 Pack two jars tightly with vegetables, garlic cloves, and dill. 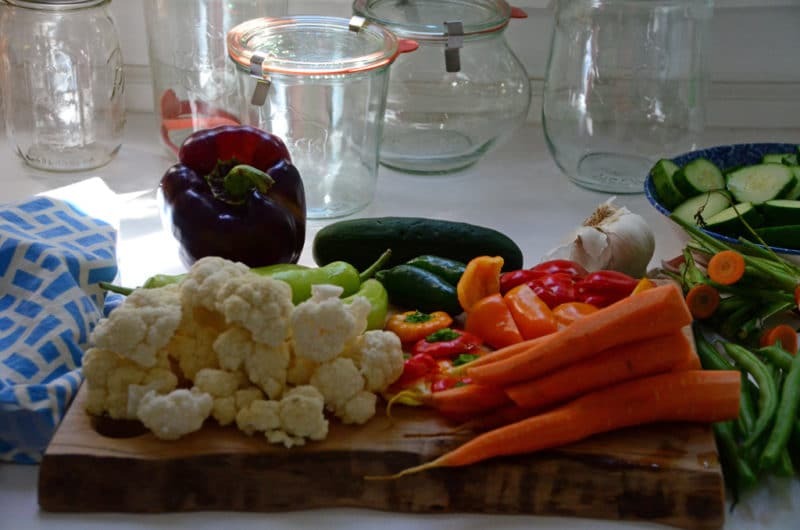 Ladle the vinegar solution into the jars to cover the vegetables. Top with the lids to the jars and refrigerate. The pickles are ready to eat as soon as the next day, but gain flavor over time. 23 Responses to "Lebanese quick pickles, and my mouneh"
I bought Barbara’s book and it is a treasure; love making mouneh, just don’t get around to it! I’ll just have to go live in a mountain village. The First Commandment begins with the word “remember,” and Sabbath is a kind of storehouse we steep in, an elixir that preserves us. Thank you for evoking the sacred nature of the ways we remember and for pointing me to Cindy Hunter Morgan’s wonderful poem. Thank you for these thoughts and pictures, Maureen, and for sharing a link to my poem. It is interesting how having something to preserve helps us release what we don’t feel ready to part with. The poem is so beautiful and your jars look gorgeous. I remember so well my mother preserving everything this time of year. She knew how much of each thing she needed to get her to the next harvest. She counted the jars and said this many for beans. This many for tomatoes. This many for pickles, etc. By winter we didn’t ever have to think about “store bought” when it came to vegetables. And the numbers always seemed to work out just in time to enjoy fresh with an empty cellar ready for the next year. With our drought I don’t have too much to pickle, but I took a quick look in the fridg and am going to try this today with what I’ve got. And remember all of those days of harvest. Oh, she pickled vegetables too, but the fruit immediately came to mind when I read your beautiful column today. Your stories, recipes and pictures transport me to a whole new beautiful world of culture and people. 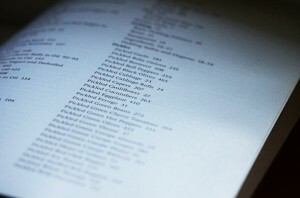 I hope to try some of our recipes some day. Thank you for the virtual journey. Thank you so much, and good to see you here. I wish the book was available in the US! Did you buy it from Lebanon? Yes! I bought it from Buy Lebanese but check on Amazon too! Hi Maureen! I am 4th generation Lebanese-American (Coreys, from Deir Mimas in fact!) and recently decided to immerse myself in my heritage by only cooking Lebanese food for a month. Just wanted to say I’m so glad to have found your website, it is a tremendous resource, and it makes me so happy to read the anecdotes about your family and see how similar they are to my own. We really are all cousins, aren’t we? Hannah, cousin from Dier Mimas! What a special thing you’re doing by cooking Lebanese food and connecting with our heritage that way. I’m honored to be part of your kitchen as you do this, and to know you are there reading and cooking. Warm wishes and a big hug to you–please be in touch along the way! Excellent blog! I really enjoy your writing and recipies. Can I ask what kind of peppers would I find in Lebanon exactly? Do they have varieties such as serrano, jalepeno or is their a certain group or kind that would be indigenous or more authentic? I’m always searching for the most authentic ingredients as I find food from the Levant to be the best tasting and more importntly the healthiest. Hello, and what an interesting question. Though we do cook with heat, it tends to be from dried pepper or jalepeno rather than any specific Lebanese pepper. Aleppo Turkish pepper is the most common hot Middle Eastern pepper I know if. Now you’ve sparked my interest…more to come on this! Thank you! I do southern sweet pickles, which I put through a 10 minute water bath. Can I do the dame with these pickles? 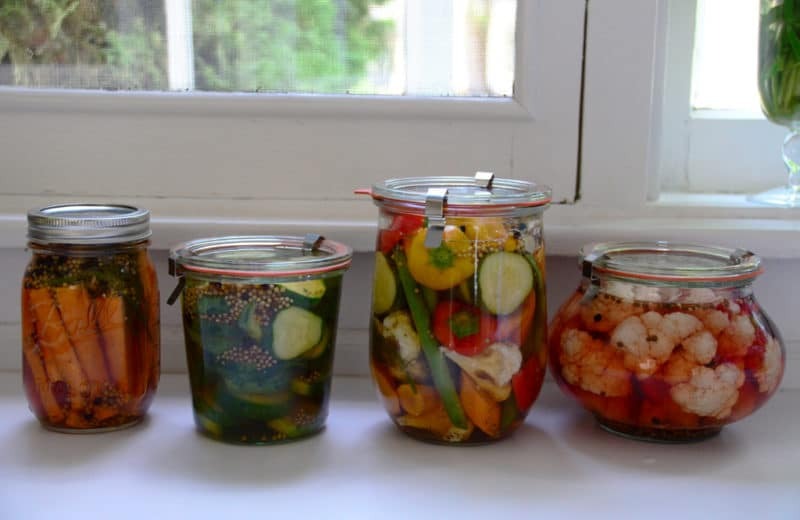 Hi Steve–these should come out fine treating them as you would any other pickle, like your sweet southerns, for shelf life in a hot water bath with sterilized jars. Hello! These will keep for about two weeks, typically longer! Do you happen to have a recipe for Lebanese Wild Cucumber Pickles? I’m trying to make them for my husband, but can’t seem to find a recipe. I know they are not sweet, so wondering if I use regular cucumbers (or small cucumbers, since I don’t have access to buy wild cucumbers), will they come out the same if I omit the sugar? Where would you put the powdered turmeric that you mention above the recipe? Thank you! Hi Cindy–to add turmeric, just include with the other spices at the start with the vinegar. You can try this with any cucumber! Where do you find your beautiful jars? Can this be made without the sugar? So glad I happened upon your blog. I cannot wait to try your recipes. Thank you Tammy! I’m glad you’re here too! Look for Weck jars; you can get them from Weck or other suppliers. So pretty!